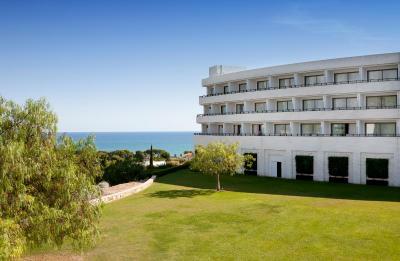 Lock in a great price for Dolce Sitges – rated 8.5 by recent guests! Amazing views, amenities, staff, food and location. 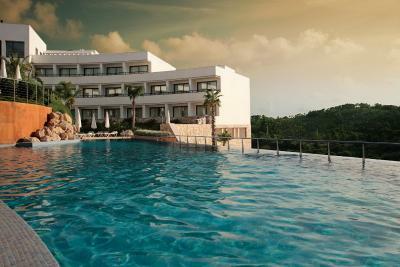 The outdoor pools are great, the indoor pool is great, the spa is clean and very well equipped. Will definitely come back! Breakfast is great, especially when you have it outside, with all this scenic view! The hotel’s over all view on the sea Spa is also good facility..
It’s really 5 star. The beds are good and the hotel is luxurious. The facility is truly beautiful and the surroundings picturesque. The infinity pool and its' overlooking view are spectacular. And personally, I am a tennis fan ... late on the night of my stay, they had the finals of the men's u.S. Open playing at a the publicly convenient late night bar. That was a nice touch. Although far from the sea, mountains are stunning. Restaurant LaPunta is good quality. Breakfast is poor for 5*. Well, once we realized the type of beach town Sitges was, we were very thankful to be up and away from the main city. Dolce provided a nice place to get our family away from the craziness and filth. The breakfast and dinners were great. Pool area was decent and bar staff were nice. Shuttle to beach was convenient. Kids liked the pool table and chess. Not a 5 stars service, fortunately not a 5 star price either. 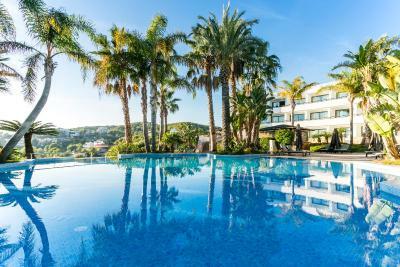 Dolce Sitges This rating is a reflection of how the property compares to the industry standard when it comes to price, facilities and services available. It's based on a self-evaluation by the property. Use this rating to help choose your stay! 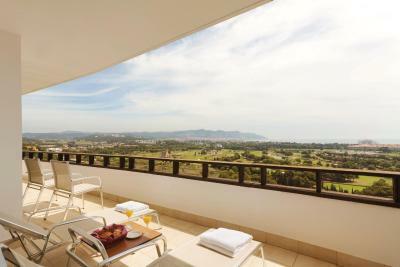 One of our top picks in Sitges.Located 1.2 mi from the beach in Sitges, Dolce Sitges overlooks Terramar Golf Club and the Mediterranean sea. 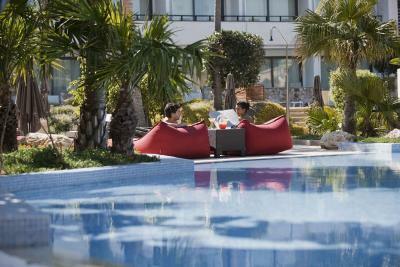 It provides 4 seasonal and furnished outdoor pools surrounded by gardens. 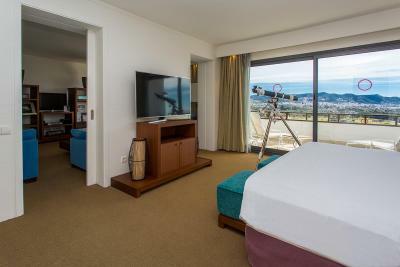 Modern air-conditioned rooms have free WiFi access, a flat-screen TV, and a private terrace with great views. There is a laptop safe, mini-bar and tea and coffee making facilities. The private bathroom comes with a hairdryer, bathrobes and amenities. Dolce Sitges has 3 restaurants, 3 bars and a chill-out lounge, offering everything from à la carte fine wine and dining, to poolside snacks and cocktails. There is also a boutique restaurant serving local products. A 24-hour room service is also available. In summer, the property organizes themed dinners and barbecues in the garden. Guests have access to the Dolce Vital Spa with indoor pool, hot tub, sauna, ice fountain and steam bath. Therapies and beauty treatments are available. A 24-hour fitness room fitted with Technogym equipment is also available. 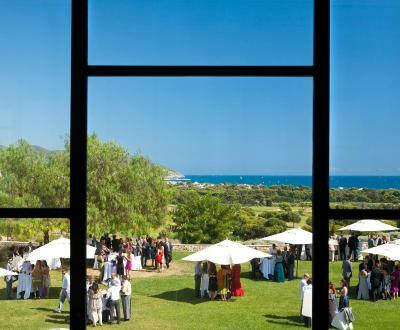 There is a 24-hour reception and a tour desk and a free transport service to the beach is available in summer. Free on-site parking is offered, and Sitges center is 2.2 mi away. 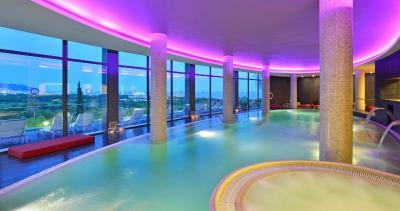 By train, the hotel is just 25 minutes from Barcelona International Airport and 50 minutes from Barcelona city center. When would you like to stay at Dolce Sitges? 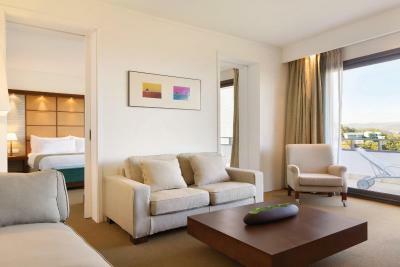 Featuring a large, private terrace, this more spacious, elegant room includes a seating area with a sofa bed. It also includes air conditioning, a flat-screen HD 4k 55” TV with international channels, a mini-bar, tea/coffee facilities, and work desk. The bathroom is equipped with a hairdryer and toiletries. The maximum capacity for this room is 2 adults and 2 children up to 11 years old sharing a sofa bed. Offering direct access to the pool from its large terrace, and panoramic views, this more spacious, elegant room features a seating area with a sofa bed. It also includes air conditioning, a flat-screen HD 4k 55” TV with international channels, tea/coffee facilities, and work desk. The bathroom is equipped with a hairdryer and toiletries. Offering views of the Mediterranean Sea, this spacious room features a bath tub and hydromassage shower. 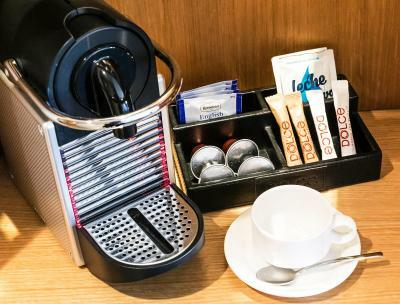 It also includes air conditioning, a flat-screen HD 4k 55” TV with international channels, work desk, Nespresso coffee machine, mini-bar, and tea/coffee facilities. 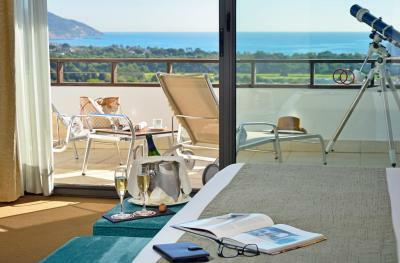 This large, luxurious suite features panoramic views of the Mediterranean Sea from its private terrace. It features a dressing room, a spacious living room and a bathroom with a spa bath and hydromassage shower. It also features a flat-screen HD 4k 55” TV with international channels, home cinema system, Nespresso coffee machine and a mini-bar. 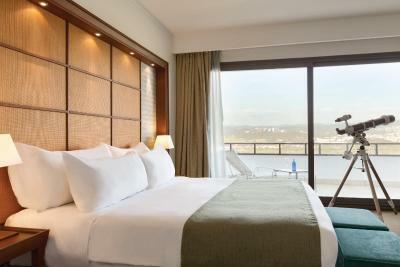 Featuring a large, private terrace, this stylish, air-conditioned room features floor-to-ceiling windows. It includes a flat-screen HD 4k 55” TV with international channels, mini-bar, tea/coffee facilities, a work desk and a bathroom with a hairdryer and toiletries. Featuring a large, private terrace and panoramic views of the Mediterranean Sea, this stylish, air-conditioned room includes a flat-screen HD 4k 55” TV with international channels, mini-bar, tea/coffee facilities, work desk and a bathroom with a hairdryer and toiletries. LUXURY ATMOSPHERE, MODERN & CONTEMPORARY DECORATION The furniture of each of the 263 rooms and suites captures the distinctive colors, textures and furnishings of the region, combining design, elegance and an urban touch. Savor a delectable combination of flavors, aromas, ingredients, and colors in one of our 3 restaurants, 3 bars, and a chill-out area. Pamper yourself with the Mediterranean and international cuisine at Restaurant Verema, overlooking the bay and the sea. 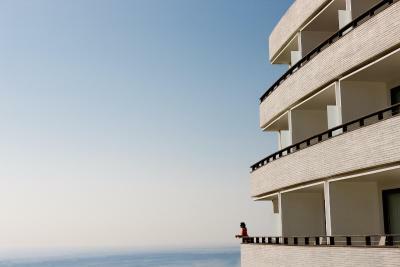 The avant-garde gourmet Esmarris restaurant is complemented with the airy La Punta terrace in the summer. From our intimate bars DDB, Malvasia and Cala Morisca, to our popular Alea Lounge, and the convenience of room service, we have something to please everyone. 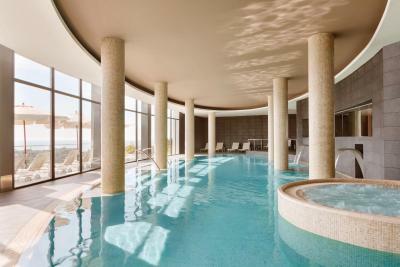 Additionally, Dolce Sitges offers 4 outdoor swimming pools, free indoor parking, and a free high-speed Wi-Fi connection. 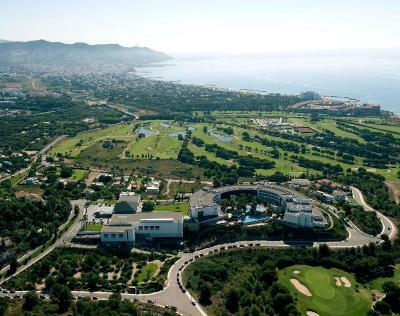 Located just 25 minutes from Barcelona Airport, 10 minutes from Sitges town and 35 minutes from Barcelona center, all 263 guest rooms and suites share a distinctive sense of privacy and sanctuary. House Rules Dolce Sitges takes special requests – add in the next step! Dolce Sitges accepts these cards and reserves the right to temporarily hold an amount prior to arrival. During the summer, the hotel offers a free transport service to the beach. You should contact the hotel for times and further details. Please note that drinks are not included in the dinner price. Spa gets a bit overcrowded at some point, even in the low season. No personal touch in the rooms, everything functional but no soul. Some of grounds outside the hotel could do with some basic maintenance and weeding. Outside the spa where the sunloungers are is all weeds. The hot food at breakfast was not very hot and more signs in the corridors are needed as we kept getting lost finding our way around! The staff were very friendly and helpful. The pool area although closed at this time of year looked lovely. Very nice and quiet place, good to rest or have a romantic WE. The bar has a small but very nice terrace on the swimming pool, with very friendly staff and good food. Free pool and spa access all along. Free parking. Very close to Sitges so very nice for night life (more activity in the summer for sure as in March). The spa has a very cousy and well equipped changing room. It is for me a PERFECT hotel !! The distance to our room. Very long walk. Spa was too crowded and water was not warm enough. Room a bit old fashion, US style. We were placed at the end of the (very, very long) corridors, despite the hotel being empty. Common facilities are great. Nibbles in the room - slippers and teddy bears for children included. Free parking nad Easy access to all facilities. The hotel has a modern feel to it although the rooms are a little dated but comfortable with wi fi and an excellent bed. Food is excellent and the staff are welcoming with an extra mention to the ladies at breakfast time. Only 5 mins, by taxi, to central sitges. The railway is very present. The massages etc. are great. Breakfast!!! A bit isolated (but that’s also positive) so you need a car. Beautiful location for a weekend break. Very quiet. Nice spa with clean facilities. Excellent breakfast.